Proper preparation of your floor surface (that Marley will cover) is essential to the long-term health of our Dance Floor as well as the dancers' personal comfort and safety. All screw heads, nails, and other hard edged protrusions should be removed or covered prior to the installation of your Rosco Dance floor. These materials can damage your floor beyond repair and cause injury to dancers. Fill cracks in the sub floor with appropriate filler or tape if needed. In a word, DON'T. If the floor is cut, you will be charged full replacement price for the rolls that are cut. Try to order pieces to fit your space or stage as closely as possible. If needed, you can overlap two rolls, especially if they are upstage or out of the way. 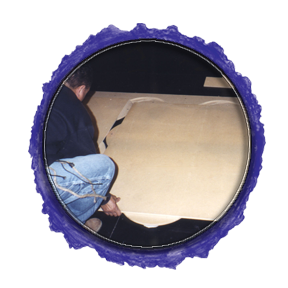 If you have a special size that needs to be covered, please contact us IN ADVANCE and we will attempt to find a solution (we frequently have odd sized off-cuts or scraps that we can provide at a much lower cost than cutting and replacing a full roll).